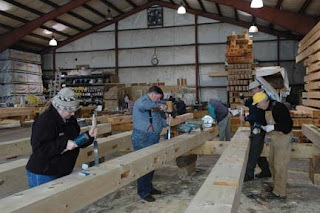 It is uncommon to think of timber framers using hand planes, much less that one is particularly well suited to timber framing. Well, I’d like to introduce you to Lie-Nielsen’s number 10-1/4 Bench Rabbet Plane, patterned after the old Stanley number 10-1/4. Rabbet planes have a plane iron that is exactly as wide as the plane body, allowing you to plane an inside corner, or plough a dado as wide as the plane. Lie-Nielsen’s version has a Bedrock frog (patented by Justus Traut at Stanley in 1895) instead of the Bailey frog which had been the standard for about 40 years. The frog attaches the plane iron to the plane body; a solidly held plane iron is critical. Anyone who has ever dug a whole on the coast of Maine knows that bedrock is solid, and that is why Stanley chose the name for it’s improved frog; it all but eliminates blade chatter. Lie-Nielsen’s plane body is made from iron, with a bronze cap and frog, and cherry handles. It exemplifies the plane makers’ precision, understanding of the art of planing, and ability to make the mundane, beautiful. When I first saw it, my mouth went dry and my hands got sweaty; I knew I had to have it. The smooth cherry handles (which almost feel soft), the gleam of the bronze, the ductile iron body, the movable knickers on each side just kept calling my name. The plane is well suited for timber framing for several reasons, the first being it’s size: at 12 ¾” long with a 2 1/8” wide iron, it tips the scales at 5 pounds, which gives it plenty of momentum when planing the tenon on an 8”x12” carrying beam. What’s even more exciting, is that both the front and rear totes (handles) pivot both right and left. 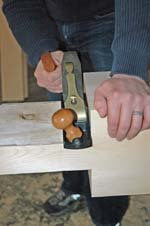 When you are planing the tenon on the right-hand end of a beam, pivot the handles to the right and your knuckles now comfortably clear the hard corner of the tenon shoulder, or any other tall inside corner. On each side of the plane body, perfectly flush, just ahead of the iron, are knickers which slide up and down and are affixed with a single screw. When planing a right hand tenon, simply drop the left hand nicker down 1/32” and it cleanly cuts the cross grain in the corner between the tenon face and shoulder. Lastly, being a timber framer myself, I know that some of us suffer from bouts of vanity. Owning and using this plane is guaranteed to make you look professional, plane a dead flat, bragging-rights grade tenon (at 90 degrees to the cheek), and look even more handsome. The April 2008 Purely Post and Beam Class had 18 people from all over the country. They raised a 24x24 pine timber frame complete with dovetail, mortice and tenon, birdsmouth, and pocket tenon joinery. They learned how to calculate roof rafter angles and basic beam sizing as well as how to work together. Our next class is our Small Housebuilding Class (currently 16 enrollees), a one week long session in which students learn a variety of construction techniques from working with prefabricated panels to building your own panels, window and door installation and metal roof installation. Visit our web site or call for more information. We use all kinds of timber framing techniques. Click the image above to view a slideshow of Hennin Post & Beam images.